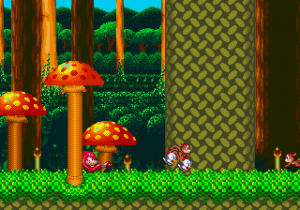 Knuckles relaxing in Sonic & Knuckles, just before he gets bombed by an Eggrobo. "Mushroom Hill" redirects here. For the Sonic the Fighters arena, see Mushroom Hill (Sonic the Fighters). For the Sonic Generations 3DS level, see Mushroom Hill (Sonic Generations 3DS). 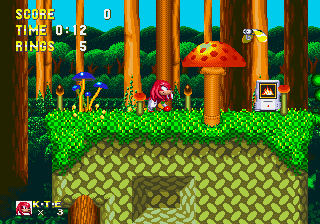 Mushroom Hill Zone is the first zone in Sonic & Knuckles and the seventh zone in Sonic 3 & Knuckles. In the latter, it is entered by Knuckles falling in and Sonic being dropped off by Tails from Launch Base. In the Sonic 3 level select the zone is listed as Mushroom Valley, the beta name of the zone at the time. This is the first 1 Player zone ever in which Knuckles the Echidna is a playable character. You see a small scene where he is attacked by one of Dr. Robotnik's Eggrobos. Note that this scene is only shown in Sonic & Knuckles, not in Sonic 3 & Knuckles. The zone is known for the many mushroom types that you find. There are some that you can bounce off of, a seesaw-type mushroom that you use to jump to a higher elevation, ones that act as falling platforms, and parachute-type mushrooms you hold onto to float into the air. There are also vines that stick you to the ground until you Spin Dash your way out of it and a lift that you crank down from to move higher up. Another unique feature about this zone is that in the second act, Dr. Robotnik is using a satellite to change the climate, causing Act 2 to be played in different seasons. Thus, the palette changes from a summer green scenery to a autumn brown to a winter gray. This changes back to summer again when the character you play as gets to the boss, and destroys Robotnik's satellite. This can be related to the scrapped Dust Hill Zone, which would have changed from a desert orange to a winter blue halfway through. This is also the only zone in Sonic & Knuckles to be altered when played as part of Sonic 3 & Knuckles: Act 1 is slightly extended at the beginning and has an additional Giant Ring (or two, if the level is played as Knuckles) , making it even easier to get all the Super Emeralds in this zone alone. At the end of Act 2, Dr. Robotnik flees in the Flying Battery, but your character runs after it and catches a ride. This page was last edited on 22 December 2018, at 22:41.